1. Rymatica Models Network: Nayeli! Thank you for taking the time for this interview! How you've been? Nayeli Fanfan: Thank you for the interview. I’ve been doing well, thank you. 2. Rymatica Models Network: First off, congratulations on winning the 2012 WCOPA (World Championships of Performing Arts) competition in Los Angeles! How did that come about and what steps did you take that provided you a chance to not only compete but win? Nayeli Fanfan: The national scout for Haiti, Nadege Telfort, was the one who first told me about the “2012 World Championships of Performing Arts.” I thought it would be a great opportunity for me to showcase my talent as a model and represent my country “HAITI” in Los Angeles. became more confident and felt I had a greater chance of winning. One goal in mind “Win for Haiti.” The big day finally arrived and I knew it would be up to me to show the world and convince the judges that Haiti has talent and can compete on a world stage. As I walked on the stage wearing a red hot dress by celebrity designer Mark Zunino, I felt so proud and blessed to finally hear the host announce the winner, 'HAITI' “Nayeli Fanfan” for 2012 best female model of the world. In a nutshell, loving what you do, having a goal, working hard at it, staying focused, motivated, humble and being friendly with others, having a support system, working hard, all those helped me to win. What does winning the championship means to me? Whenever I triumph in this life as a Haitian woman, I am able to showcase the values, beauty and talents of my country Haiti. In other words, when I win, Haiti wins! 3. Rymatica Models Network: How did you get into modeling and how long have you been modeling? 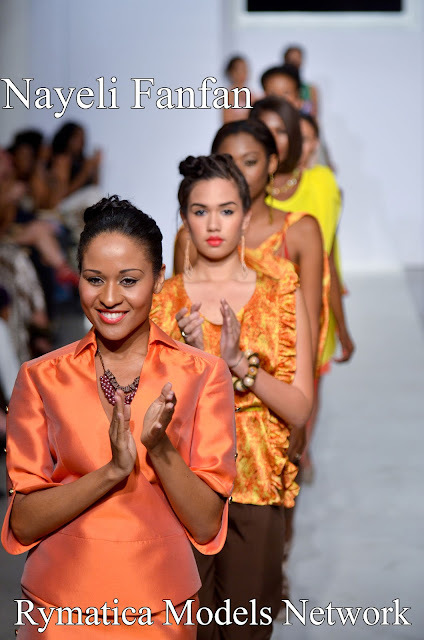 Nayeli Fanfan: I started modeling around sixteen, seventeen years old in Haiti. I have more than twelve years of modeling experience but those years were interrupted with my nursing school and my countless hours working in the hospital setting as a licensed Registered Nurse. I was never able to do modeling full time. Shortly after emerging into the world of fashion, I entered and won a series of pageants and beauty contests, where I earned great recognition. I was crowned Miss Inter-College in 2000 (Miami, Florida), Miss Florida in 2003 (Miami, Florida) and Miss Haiti International 2004 (Paris, France). I appeared on the international runway and magazine print of several cities such as: Miami, New York, São Paulo, Paris, Nassau, Guayaquil and Dublin, just to name a few. I am the face of various products in South America such as Jeep SUV, Quaker Oat, Maisabrosa, Vodka, Whiskey, Mr choc chocolate, etc. 4. Rymatica Models Network: The modeling business demands a lot of work, especially behind the scenes. How do you stay motivated or inspired? Nayeli Fanfan: Yes, it is a very demanding business. My motivation and inspiration comes from my passion for it. I love what I do. Once on stage, I am able to travel to another world, a world that I can modify as I please, my world, my space, my fairy tale! Something that no one can experience but me. Just like a musician, when he plays, he gets transported to another world, that is the feeling I get and the magic I look forward to after all these long hours of casting, rehearsal, fittings, hair, make-up and preparations. That magic keeps me motivated and inspired. 5. Rymatica Models Network: You have a great physical look and lovely smile. "A picture says a thousand words." We figure that you have a friendly personality to match, probably on the business side of modeling too. Is it so? Nayeli Fanfan: I consider myself very friendly and easy going. I love smiling. I express myself differently when I work with people who don’t care and those who refuse to meet the minimum standard of ethics, professionalism and presentation. Too all smiley face there are limits. 6. Rymatica Models Network: How do you keep yourself in great shape and in good health? Nayeli Fanfan: I keep myself in great shape by applying good eating habits, remaining hydrated and dancing. I don’t really like exercising at the gym; I find it boring at times. I prefer dancing in the house or with friends a form of exercising. As a Registered Nurse, I learned the consequences of bad eating habits and the disease caused by them. I then decided to slow down on fat, carbs and sugar to avoid fatigue, diseases and obesity. 7. Rymatica Models Network: You're inspiring many aspiring young models out there. Any advice you would like to share with them? Nayeli Fanfan: I would like them to make sure they remain prepared. Success occurs when preparation meets opportunity. Be aware that the modeling industry is very competitive and challenging. You must love it in order to do it; you must have a strong personality to deal with rejections and must have patience to deal with castings and countless hours for hair and makeup before the show. Modeling is like the lottery, more chances to lose then to win but keep at it because you never know when you just might get rewarded. 8. Rymatica Models Network: So what's next for you in 2013 Nayeli? Nayeli Fanfan: I am looking forward for my company “NFMODELING, INC.” to blossom. My company focuses on training aspiring models and empowering the girls. I have various seminars and private counseling set up for the year and I am really looking forward to making a difference in those girls' lives and hope they learn as much as they can from my personal experience in the industry. 9. Rymatica Models Network: Anything else you would like to share or mention to the audience that we haven't asked? 11. Rymatica Models Network: Thank you for this interview Nayeli! We will definitely keep an eye out for you and wish you continued success! In closing, where can the people find you on the internet? Nayeli Fanfan: www.nayelifanfan.com, I also have facebook, twitter and instagram. What is WCOPA? The World Championships of Performing Arts (WCOPA) is the first and only international competition to find the best aspiring performing artists worldwide. This competitive contest which is held annually in Hollywood, California is often referred to as the "Olympics of the Performing Arts." Competitors of every age are judged in acting, singing, dancing, modeling, instrumentalists and a variety of categories. Like the Olympics, the finest aspiring competitors from different countries are qualified and invited. Every contestant attending the World Championships of Performing Arts system has been screened, qualified and selected under specific guidelines. Founded by Griff O'Neil in 1996, The World Championships has sought out and found the next WorldStars from over 70,000 applicants and 47 countries in its decade-long competition, which culminates in an annual televised final awards show in Hollywood, California.